As they prepared to open their Footscray brewery back in July 2016, Hop Nation founders Sam and Dunc wanted to mark the occasion with a beer. They chose to do so with an IPA, the style for which they've become best known despite the breadth of their output. 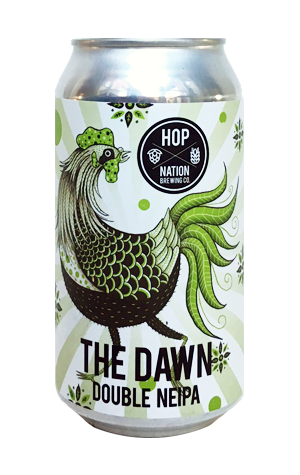 The Dawn was a double IPA bigger than arguably their best IPA, The Chop, and with the sort of deep haze later found within their best-selling one, Jedi Juice. And now it's back: in cans and destined for a far wider release. The weapons of choice this time around, other than the alcohol weighing in at a not inconsiderable 9 percent ABV, are big-hitting US and Aussie hops Citra, Mosaic and Galaxy. And, while you'll find the tropical, fruity aromas they're known for in there, it's a beer that delivers a deeper, less flighty experience on the nose, one that's more subdued and dank than many of the brekkie juice offerings doing the rounds these days. There's some pine and pineapple, maybe even some gooseberry action, alongside the tropical flavours to be found within its prickly palate, not to mention enough disguised booze to make the next dawn a dusty one for the incautious.